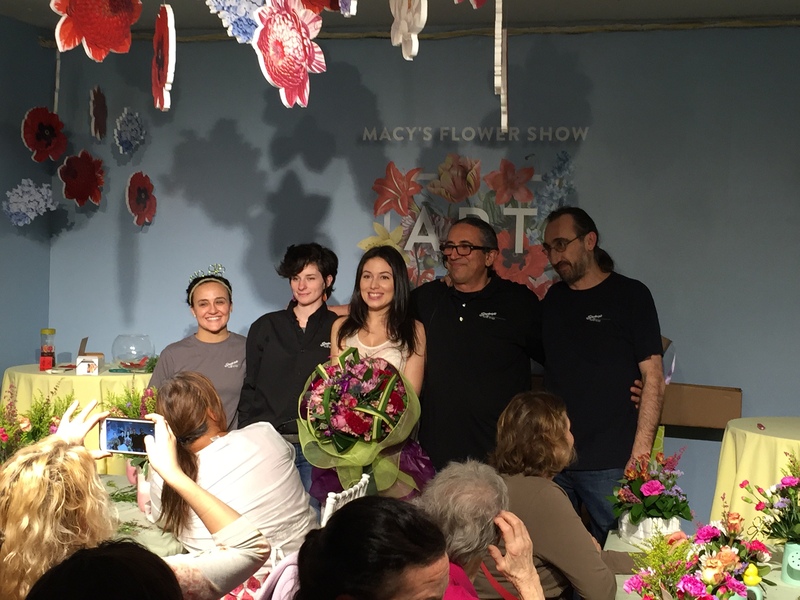 The Macy’s Flower Show-Thank You To All! The anticipation or excitement was building for days. In the 41 year history of the Macy’s flower show this had only happened twice before, Starbright would be appearing. Once the news was out, the lines started forming. Like the Beatles in 1965, Starbright was taking the city and Macy’s by storm. 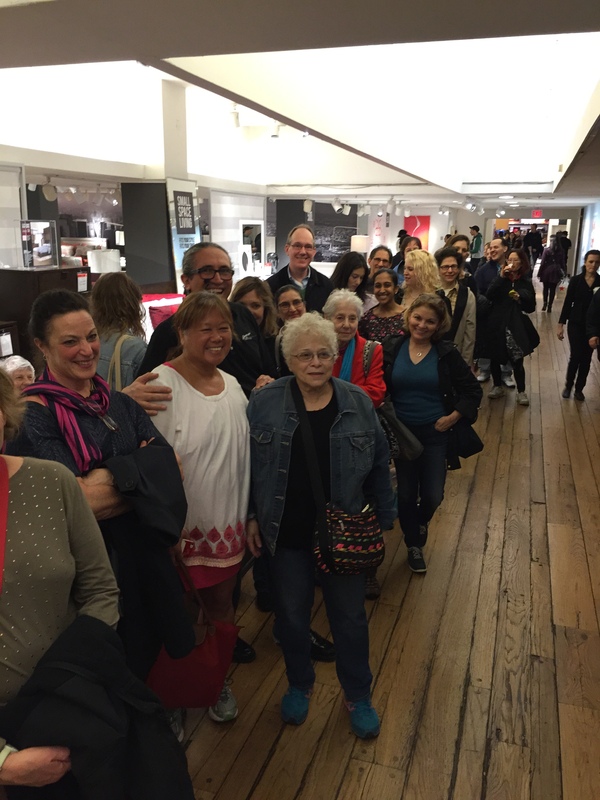 Our fans, affectionately named “Starbraniacs”, were camped out for days (Macy’s would tell you just under 10 minutes) just for a chance to get a glimpse of our leader and creative inspirator, Nic Faitos. This impromptu picture was taken of Nic with some lucky fans who finally got the chance to meet the supreme leader. The fans, never knowing when they would ever get the chance to meet Nic again (Nic would tell you just come on by the store he would love to meet you) nearly fainted from their joy. Once the crowd settled down, the floral demonstration began. This year’s demonstration centered around classic floral designing tools including designing with floral foam. The picture shows Nic demonstrating how to properly place a flower stem in floral foam. In the background you can see Socrates, a Starbright floral artist, preparing a one of a kind bouquet to be given to randomly chosen lucky winner. The lucky winner was believed to have stated that this was the single most glorious moment in her life. Macy’s is a mainstay of both New York City and America at large. We were proud to have been included in their majestic and spectacular floral extravaganza and sincerely thank Macy’s and all the attendees for the opportunity and their support. We look forward to being asked back in the near future (if the Starbraniacs promise to behave). Starbright Floral Design is the “Official Florist of the City that Never Sleeps” and we deliver smiles through flowers. Sometimes we try to deliver smiles by poking fun at ourselves in this blog, hope it worked. Author Starbright Floral Design of NYCPosted on April 8, 2015 Categories All About Starbright, Event Decor, Flowers as Gifts, Seasons, Thoughts and IdeasTags Flower Delivery NYC, Flower Show, Macy's, Starbright Floral DesignLeave a comment on The Macy’s Flower Show-Thank You To All! Macy’s Flower Show-Come by and see us! Spring flowers are here in NYC. For 41 years, Macy’s has welcomed spring with their annual Flower Show at their flagship location in Herald Square. It truly is a New York City event that is not to be missed. 2015’s event is themed, Art in Bloom and is running from March 22 through April 4. This year Macy’s has added an attraction that can’t be missed. 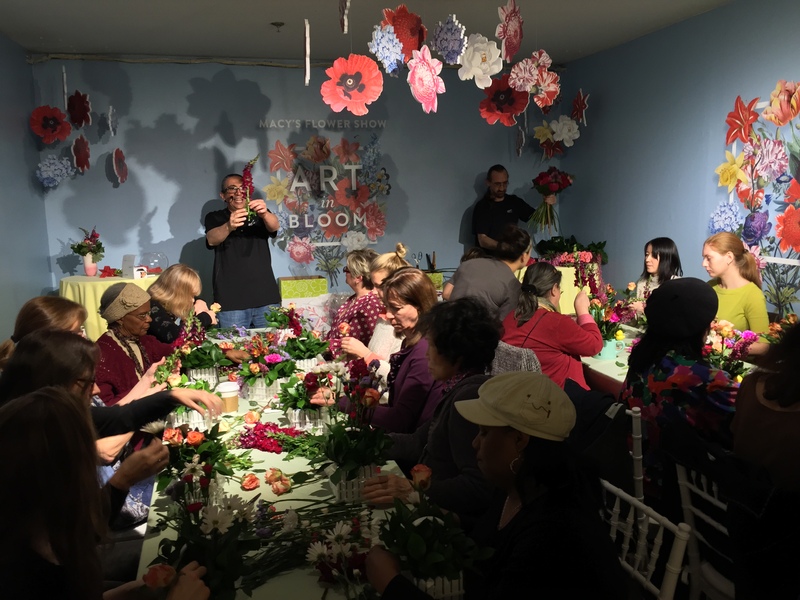 Sure they will have dramatic showpieces, and breath-taking displays of flowers guaranteed to bring a smile to all, but in addition, Starbright is thrilled to have been asked to present a Macy’s floral seminar for the third time. Mark your calendars and set aside Friday, April 3 to come visit it us at Macy’s. This year’s selected topic is classical floral designs with a Starbright spin. Macy’s has long been a mainstay of both New York City and America at large. We are proud to have been included in their majestic and spectacular floral extravaganza. Not only does Starbright appreciate being included in this long-standing New York tradition, but we also join Macy’s in welcoming spring and saying thank you to the flora that makes this season sing! Author Starbright Floral Design of NYCPosted on March 24, 2015 Categories All About Starbright, Event Decor, Flowers as Gifts, Seasons, Thoughts and IdeasTags Flower Delivery NYC, Flower Gifts, Flower Show, Macy's, Starbright Floral DesignLeave a comment on Macy’s Flower Show-Come by and see us! New York Celebrates The Lunar New Year! Millions of people around the world gathered to celebrate the start of the Lunar New Year this week. Here in New York, the party is just getting started! Celebrate the holiday in style this weekend with these helpful floral hints. These cheerful yellow flowers, also known as daffodils, are a sign of good fortune and prosperity. They are one of the most auspicious flowers to include in New Year celebrations. A symbol of the sun, these fruits are a sign of abundant happiness. If you’ll be attending a Chinese New Years party at a friend’s or family member’s home, consider taking a basket of these cheerful fruits. To make a tasty treat basket more traditional, add some candied nuts – peanuts are a favorite and symbolize a long life. These delicate blooms are symbolic of abundance, refinement, and luxury. Whether you prefer the large Cymbidiums, smaller Mokaras, or living Phalaenopsis – orchids are a highly desirable gift during this season. Check out some of our favorite arrangements featuring orchids here and here. These lovely blooms are often associated with riches and honor. This blooms are also a popular symbol of feminine beauty and affection. For Chinese New Year celebrations burgundy peonies are considered particularly auspicious. While selecting your blooms this weekend, focus on warm colors. Red is by far the most popular color as it traditionally is associated with good fortune and joy. It is also a good idea to avoid white flowers as this color can represent mourning. Want to join the fun? Check out the Chinese New Year parade this Sunday at 1pm, February 22nd 2015. See you all there! Author Starbright Floral Design of NYCPosted on February 20, 2015 Categories Color, Flowers and New York CIty, Flowers as Gifts, Inspiration, SeasonsTags Chinese New Year, flowers, Lunar New Year, Narcissus, New York, Oranges, orchids, PeoniesLeave a comment on New York Celebrates The Lunar New Year! Be the most welcomed guest this Holiday Season when you arrive with a potted amaryllis home gift! 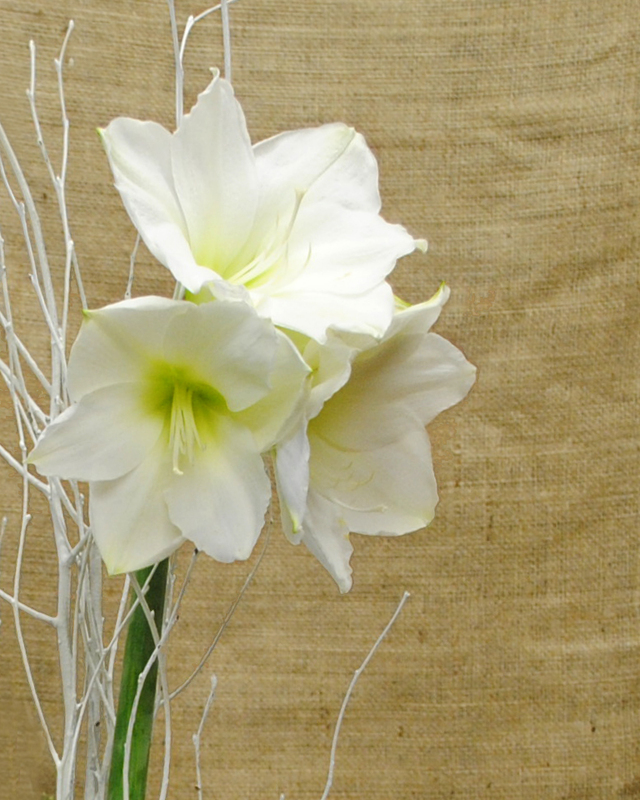 Here at Starbright Floral Design potted amaryllis are flying off the shelves. Available in shades that range from Red to White, these potted plants are some the easiest to bring to bloom year after year. In last week’s flower file, we reviewed some facts about Amaryllis blooms; like how they ended up with two names and where the name Amaryllis stems from. Popular during the holidays, these potted plants are an easy to care for lively addition to any home. An amaryllis plant will keep you with a company of blooms for about 7-10 weeks. They’ll bloom for a longer time during the winter than if they open later in the spring. Read on for instructions on how to care for an amaryllis plant. 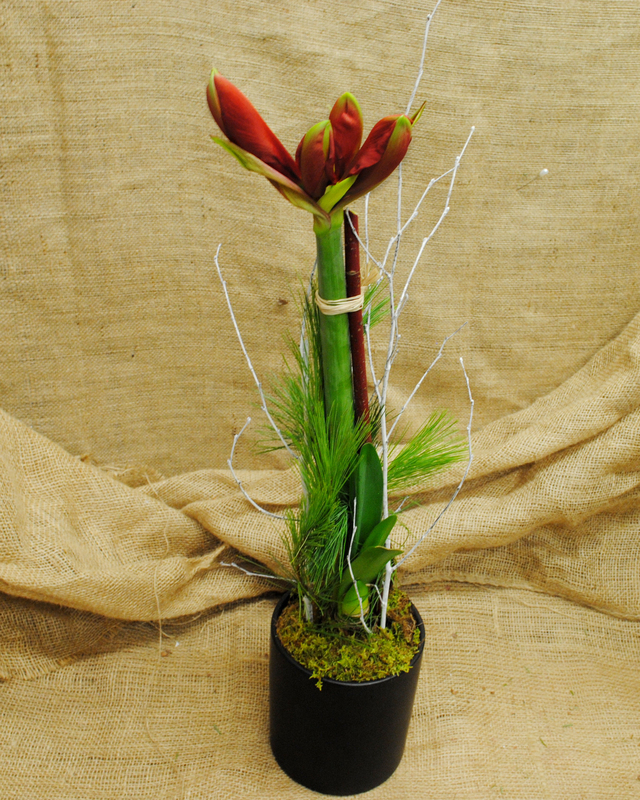 Through the holiday season keep potted amaryllis is a place with diffused light and cooler temperatures. When watering the amaryllis plant, be careful not to get the part of the bulb or plant that sticks above the soil wet. Keep the soil moist and fertilize as frequently as your favorite floral fertilizer suggests. Later in the winter, the amaryllis will stop blooming. Cut the old flowers from the stem a bit below the wilted blooms. You’ll be left with some sword-like leaves and a long stem. As soon as the stem starts to sag, cut it off about an inch above the bulb. This triggers a growth period. Move the amaryllis plant to a sunny location.Continue to water and fertilize the potted bulb as normal for at least five to six months so that the leaves can reach their full potential. When the leaves begin to yellow cut them back to about two inches above the bulb. After the leaves are cut, remove the bulb from the soil and gently clean it off before storing it in the bottom drawer of the refrigerator for a minimum of six weeks. WARNING : Don’t store amaryllis bulbs in the same space as apples. Apples will sterilize the bulb. The bloom will appear again and again as long as these easy steps are followed. It’s a rinse and repeat process that will be enjoyed year after year. If you’re not sure about how to best bring or send a host gift for the home check out this blog (Saying Thanks With Flowers) for some suggestions. 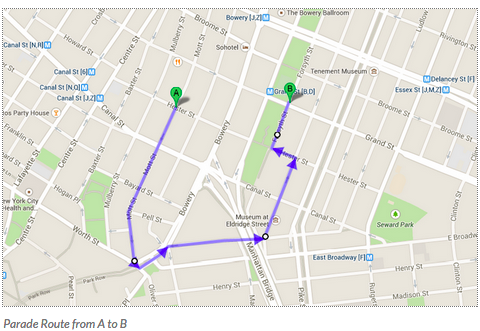 Situated in the heart of NYC, we’re ready for your last minute orders in Manhattan. Starbright celebrates the holidays with Teleflora in New York City! Hanging on various walls and scattered throughout the shop, are a number of plaques proclaiming Starbright Floral Design as one of the top 50 sellers in the Teleflora network. 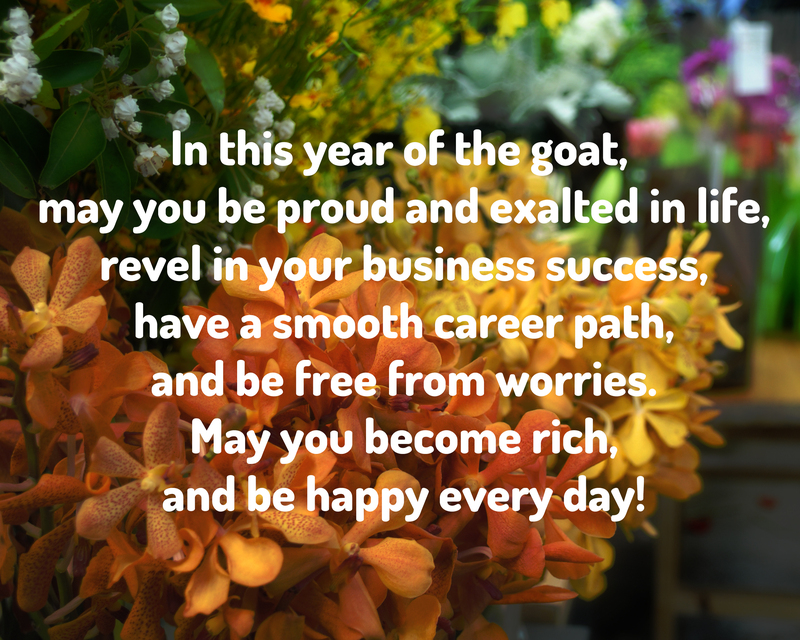 It’s a great place to be – in the Top 50 of a network including more than 15,000 member florists in the US and Canada. For over twenty years now, Starbright Floral Design has filled and sent orders to this network of talented florists. We’re all unique shops, many of us with our own unique styles, but together, with the stellar design direction of the Teleflora team florists all over are able to send exactly what you’re looking for. 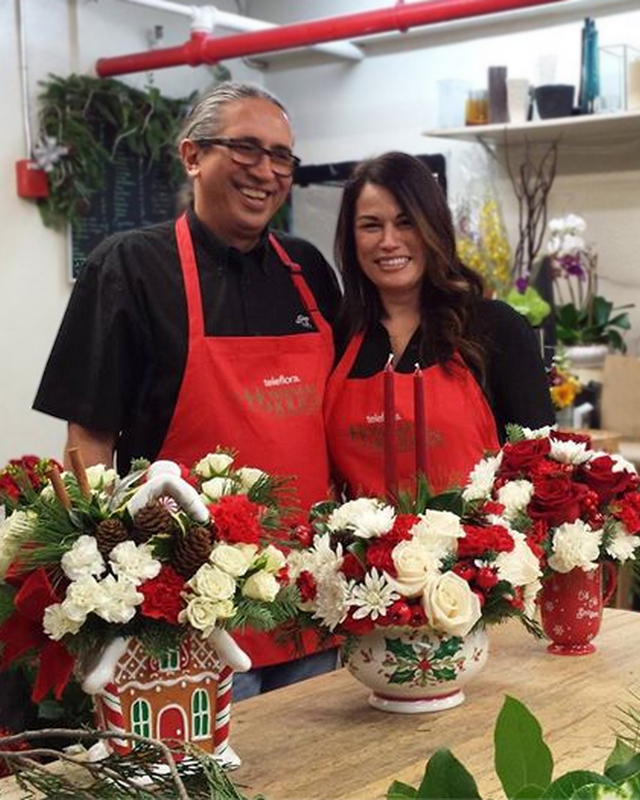 Earlier this week, Jasmine Corzo, a familiar face from the Teleflora design team, stopped into Starbright Floral Design with a camera crew, some clippers and a plan to introduce us to the Telefora holiday centerpieces and seasonal lineup collection for 2014. The Teleflora arrangements this year remind us of being home for the holidays. The designs include traditional premium floral varieties, which bring out the colors of the season. 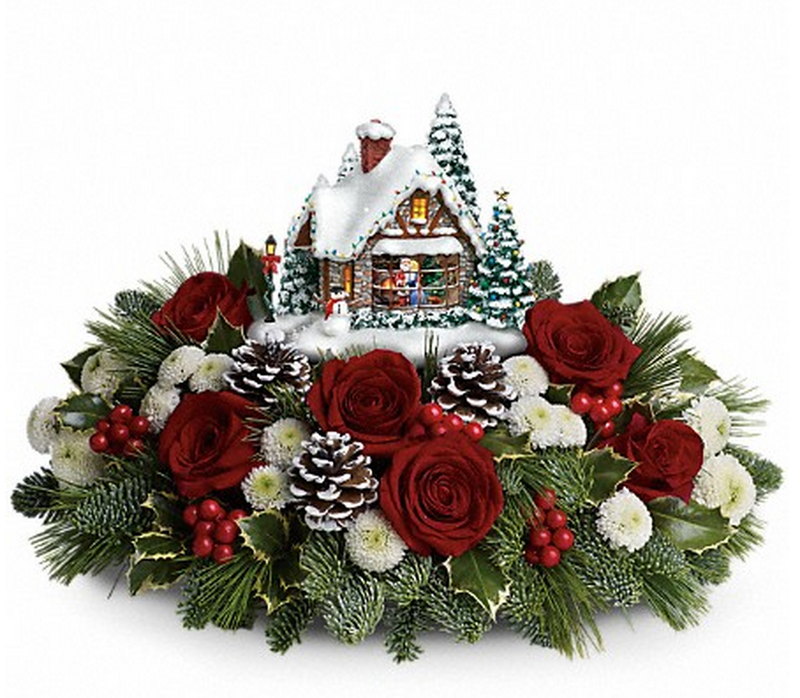 Pieces like Teleflora’s Candy Cottage and Thomas Kinkade’s Meet Me Under The Mistletoe include winter greens like white pine and noble fir with snowy bright whites and velvety deep reds. Frosted pinecones and peppermint carnations, and big red berries are playful seasonal favorites that add great texture to these lush pieces. But it’s not just about the flowers! 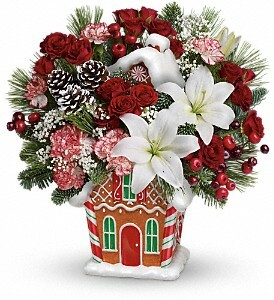 Many of the Teleflora holiday arrangements are made to fit a special seasonal keepsake. While the premium flowers used in these arrangements have a great vase life, the vase they come in will surely be a longtime favorite. You’ll want to bring these cookie jars, mugs, and decorative vases out year after year and reminisce about when Aunt Ana, Grandpa Redd, or your nephew Hugo sent you flowers. 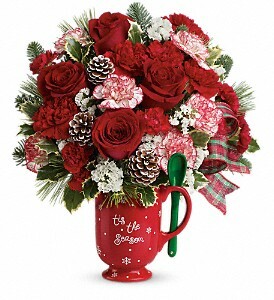 As if the fancy flowers and festive vases aren’t enough, sending any item from the Teleflora Homemade For The Holidays Collection comes with a chance to enter their Holiday Sweepstakes to win a trip to NYC! Tis the Season for new floral designs! Starbright Floral Design is excited to release the first installment of our Holiday Collection! 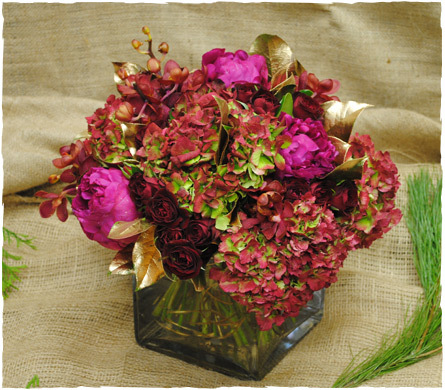 Hydrangea, peonies, roses, and orchids get extra dressed up with gilt leaves and golden colored wire. The ruffled texture and rich rosy shades are the type of holiday lush you want to bring home for dinner. 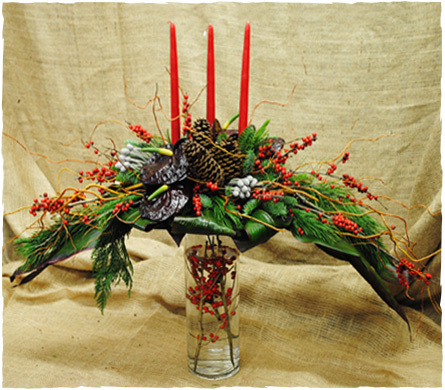 The wine and gold coloring of this arrangement makes it suited for the season, without a holiday theme. There’s nothing like New York during the Holidays and one of the best places to celebrate – Rockefeller Center. Whether you’re planning to visit for the tree lighting (Wednesday, December 3rd! ), seeing the 41st annual Merry Tuba Christmas performance (Sunday, December 14th) or going to the Top Of The Rock Rockefeller Center will show you a great time. 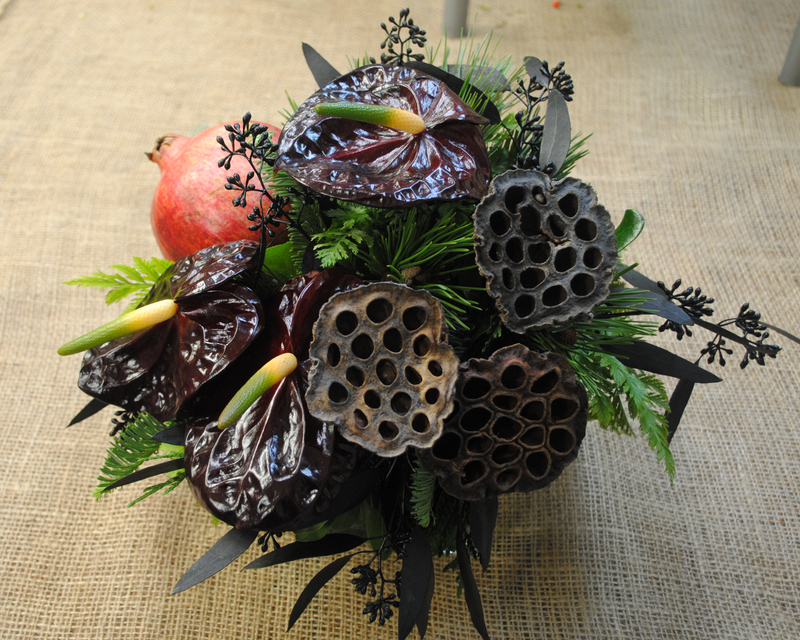 This arrangement with berries, calla lilies, anthurium, pinecones and winter greens echoes the hustle and excitement of one of our favorite centers of commerce here in NYC. This dramatic piece echoes the natural beauty of Frederick Olmsted’s Central Park design. With the arrangement’s classic tribute to the holiday designs of yesteryear you can transform your space into a seasonal winter wonderland…without having to step outside! Author Starbright Floral Design of NYCPosted on December 3, 2014 Categories Christmas, Event Decor, Flowers and New York CIty, New York, Other, SeasonsTags centerpiece, central park, decorations, florals, flowers, holiday flowers, holidaysLeave a comment on Holiday Collection Preview! 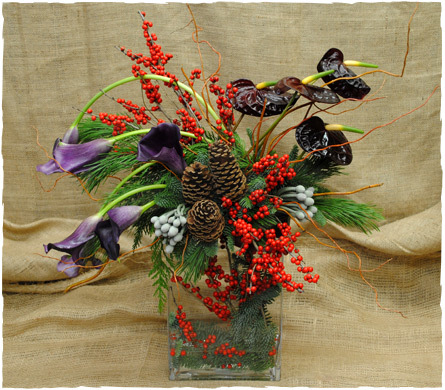 Here at Starbright Floral we love the earthy elements that characterize this time of year. We’re all about leaves, pinecones, sticks – the whole woods and the whole harvest. But when you’re planning an event that isn’t holiday related, beware of seasonal stereotypes. Seasonal sophistication is about incorporating an aesthetic without sticking to the standards. Go ahead and look past the pinecones and pumpkins – they’re not going anywhere. The fall/winter season offers a host of alternatives to the traditional floral fare. Lotus Pods : These seed pods are exceptional. The wood-like appearance and organic texture is unlike most formal elements. The pods, which grow alongside lotus flowers, begin small and as the seeds grow, the holes in the pod increase to accommodate them. We’re not saying that every flower has to have a meaning, but the idea of growing into each other strikes Starbright’s fancy. Fruits and Nuts : Generally speaking, using edibles in floral arranging is pretty traditional unless you go for the exotic types. We love using pomegranates and citrus for the shots of color and a festive nature. Curly Willow : Wrap vases or integrate curly willow into the arrangement for a refined version of rustic that will fit a sophisticated style. The rich sienna color also echoes the warm tones of the season without being seasonal. Sprayed Seeded Eucalyptus : Ok, ok – this one isn’t at all natural, but we love it anyway. Seeded eucalyptus has a delicate appearance, and is a great filler for large flowers that want a little something more than greenery. The natural silvery green color of eucalyptus can soften the overall appearance of an arrangement. Our favorite ways to dress up the seeded eucalyptus are in gold, silver, copper, and black. Deep Colors : Starbright loves the warmth and drama of saturated hues. Many floral varieties are available in deep shades of red including the anthurium (in photo), roses, carnations, and calla lilies. Check out one of our modern favorites.